This briefing presents and analyses the findings from a survey of the general public in Scotland on trust, confidence and support of charities. The key findings are based on a telephone survey of 1,088 respondents (adults aged 16+) commissioned by SCVO and conducted by Ipsos MORI during 27th Nov and 5th Dec 2017. The data for young people (16-24) is based on 121 interviewees, with a weighted sample equal to 155. The 2017 results are compared against the 2015 SCVO/Ipsos MORI poll and other data sources where relevant. 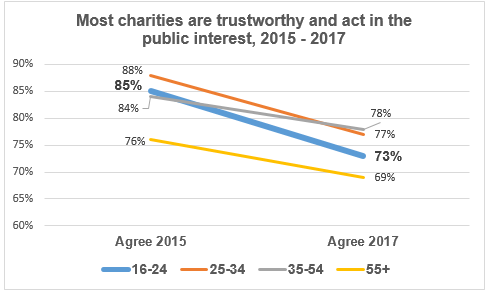 The majority of young Scottish people agree that ‘most charities are trustworthy and act in the public interest’ but the number agreeing fell from 85% in 2015 to 73% in 2017. Young people’s trust in charities in general has dropped. In 2017, 38% of young people gave charities high scores of 8/10 and above, down from 51% in 2015. 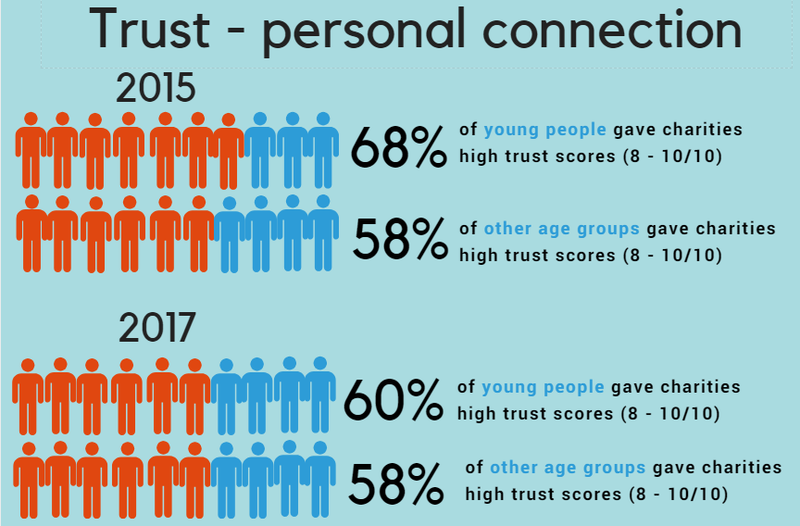 Young people were also the only age group to report a drop in trust in charities they have a personal connection with. In 2017, 60% of young people gave charities they are familiar with high scores of 8/10 and above, down from 68% in 2015. 41% of young people said their trust in charities decreased over the last year, a large swing from 2015, when only 14% said trust had decreased. 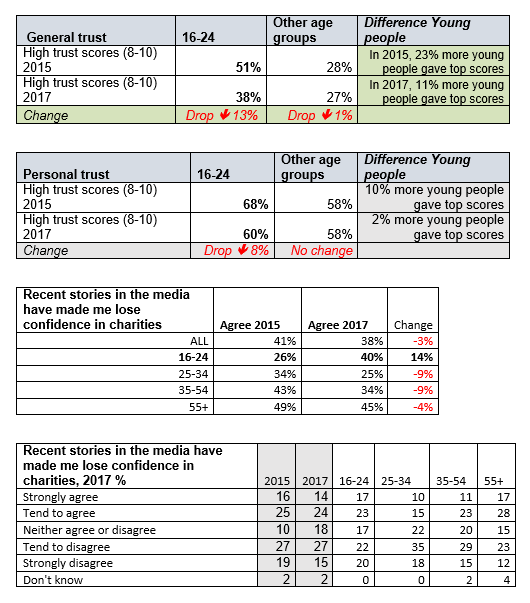 40% of young people agree negative media stories made them lose confidence in charities, up from 26% in 2015 – the only age group that saw an increase. 21% of young people agreed that recent personal experiences had made them lose confidence in charities, up from 8% in 2015 – the largest increase of any age group. 72% of young people believe that charities play an important role in their communities. This is lower than the other age groups (where 79% agree) perhaps due to lower awareness? Trust in charities in Scotland is high, and young people (16-24 years old) have more trust and confidence in charities than older age groups. However, the gap is closing with 2 in 5 young people reporting that their trust in charities had decreased over the last year. Young people are important as supporters, champions, ambassadors and volunteers: how do we communicate what charities do and the values we hold, in a way that is engaging? What do young people need to know? Are our volunteering and board opportunities meeting their needs? 2 in 5 young people agreed that negative media stories had made them lose confidence in charities – is this negative traditional media or social media? Can we help by telling positive stories? 1 in 5 agreed that personal experience had made them lose confidence – what are these negative personal experiences? 28% of young people don’t believe that charities play an important role in their communities – is this an informed belief, or is it that their current understanding of what charities do is too narrow? How can we help communicate the impact of charities? ‘Young people’ are not a homogenous group – how do we communicate with different sections, ages etc? What are the issues and values that are important to young people, e.g. environment, human rights, Sustainable Development Goals? Do they see charities as a way to address these issues or not? Are there any specific resources or activities we need to co-produce? 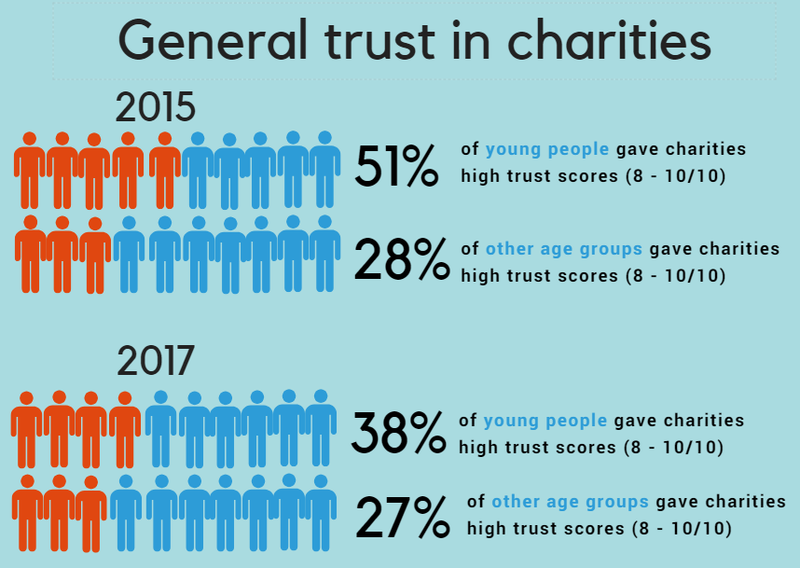 In 2017, young people gave charities an average trust score of 6.4 out of 10 for trust, far higher than the 5.8 average given by other age groups. More than a third (38%) of young people gave charities high scores (between 8 and 10/10), compared to 27% in other age groups. However, young people’s trust has dropped significantly from 2015 levels, when a majority 51% gave high scores, while figures for the other age group have stayed pretty stable (2015: 28%, 2017:27%). 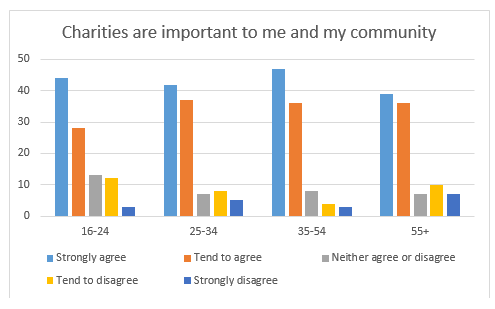 When asked about those charities they have a personal connection with, young people gave slightly higher scores than older people, but the gap between the age groups is small and shrinking. 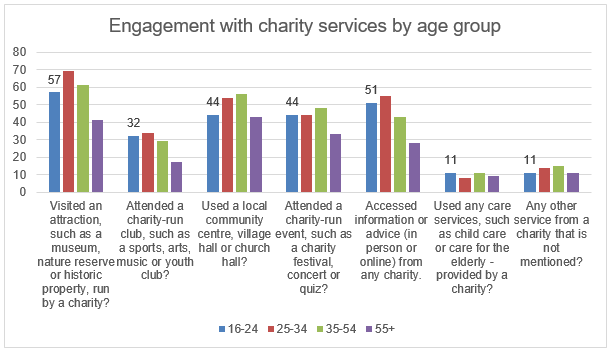 In 2017, 60% of young people gave charities they have a personal connection with high scores (between 8 and 10/10), compared to 58% in other age groups. Young people’s trust has dropped slightly from 2015 levels when 68% gave top scores – while the other age groups saw no drop in trust. Further, in 2017, 22% of older people gave the charities they had connections with the top score of 10/10, against only 12% of young people, who tended to give marks around the 8/10 and 9/10 mark. The lower figures around personal trust may be due to young people using less services than people in age groups 25-34 and 35-54; alongside other issues such as negative media stories or personal experiences. 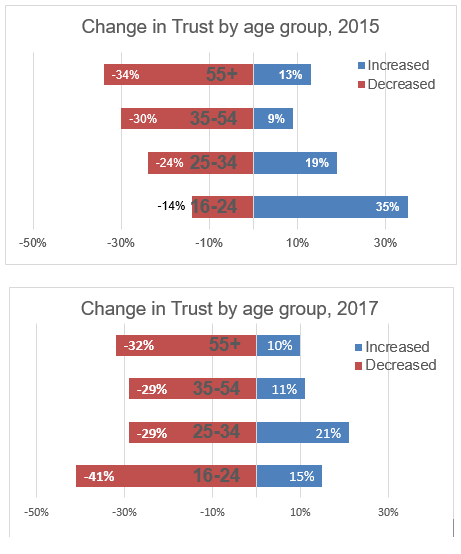 Changes in trust for most age groups did not change remarkably, but for young people we saw a large swing from positive increases in trust in 2015 to negative decreases in trust in 2017. In 2015, 35% of young people said their trust in charities had increased a lot or a little – far higher than any other age group. Only 14% said their trust had decreased. But in 2017 these figures have been flipped. Only 15% of young people say their trust has increased, and 41% said it has decreased – again higher than any other group, but this time a negative change. 25% said their trust had ‘decreased a little’: and 16% said that it had ‘decreased a lot’. 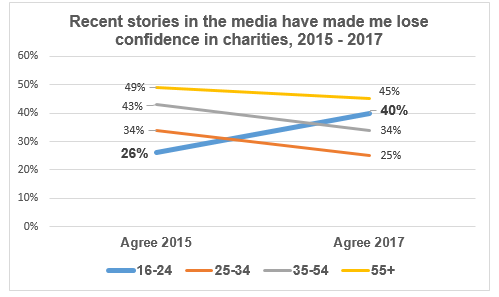 In 2017, 40% of young people agreed that recent stories in the media had made them lose confidence in charities – this is a 14% increase from 2015. In all other age groups the reported influence of negative media has gone down (see figure below). Young people are now the second most likely age group – after those aged over 55 – to say that negative media stories have made them lose confidence in charities. 72% of young people agree that charities are important to them and their communities, which is good news, but is lower than all the other age groups. This, along with negative media and perceptions of charities, highlights the need to do more work with young people and showcase the work that charities do in local communities. • The youngest, 16-24 year old, respondents were more likely than all older respondents to have had any contact with charity (16-24 66%, 25+ 43%) and to have had contact through work or volunteering (16-24 53%, 25+ 26%). • Under 25s (50%) were more likely than those 25 or over (32%) to have donated cash under the value of £50 in the past twelve months. However, under 25s (16%) were less likely than those aged 25 or over (37%) to donate over £50. There was no difference amongst age groups in the likelihood to donate money overall. • Confidence in charities decreased with age, with the youngest groups (16-24 6.48, 25-34 6.32) scoring higher than the oldest group (65+ 5.58). Interest remained high in 2016, but OSCR survey does seem to picking up a light downturn. • Factors which have underpinned this growth in youth volunteering from 33% in 2009 to 52% in 2016 include ‘push’ and ‘pull’ factors, the jobs market, awards and recognition, and targeted support. Younger people are less likely to donate money regularly than older people, with 26% donating ‘rarely’ and 57% donating ‘from time to time’. Young people are more likely to volunteer, sign a petition and take part in a public demonstration or protest, with nearly ¾ of young people signing a petition in the last year.